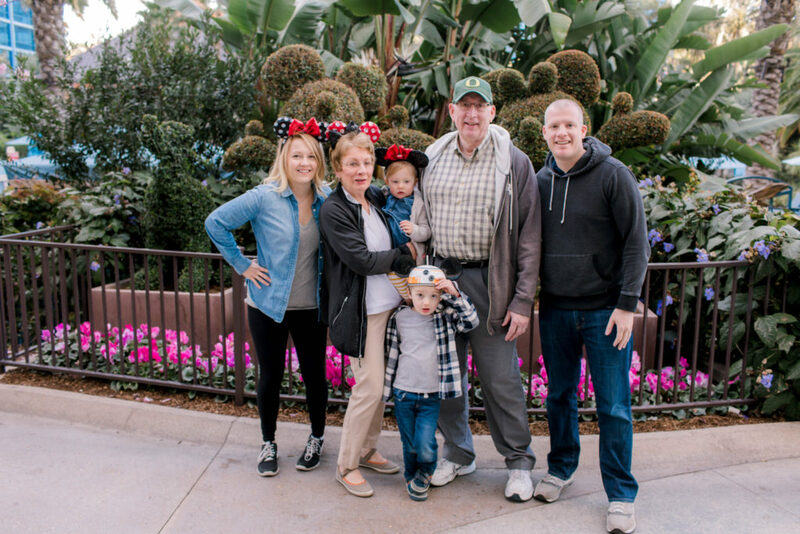 This February we traveled to Disneyland with our 2 and 5 year old, and some very helpful grandparents. 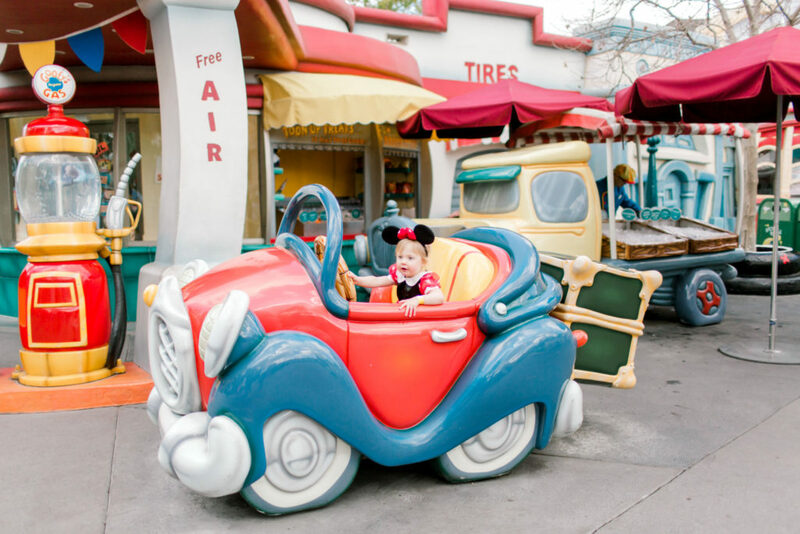 Below are my tips for traveling to the Happiest Place on Earth with little ones (toddler and preschooler), as well as photography things of note and best places to take pics. 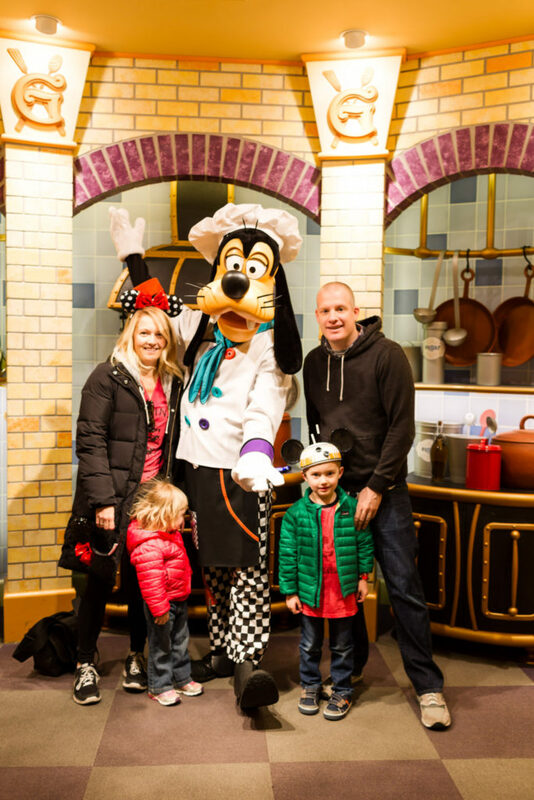 By no means am I a Disney expert – these are just my takeaways from one fantastic trip! view from our room at the Disneyland Hotel! We flew into the Santa Ana/John Wayne airport and took the Disneyland Hotel shuttle bus (runs on the half hour, every hour) to the Disneyland Hotel. My MIL timed the flight well so we only waited 5 minutes for the bus at the terminal. We were out of the airport in a jiffy! Not dealing with a rental car was so nice. I believe the ride from the airport to the hotel was complimentary, but the ride back you need to purchase tickets in advance. We stayed at the Disneyland Hotel and had a great time. It is very clean, staff were wonderful, and there are little hints of Disney throughout the room. Our headboard even lit up and played A Dream Is a Wish Your Heart Makes. Kids had so much fun with that. It was so nice being close to the parks. The Grand Californian is another, close option. It certainly would’ve been harder to stay in a hotel off site. there is a line for this photo opp. best light, and shortest line first thing in the morning! MAGIC HOUR = SO HELPFUL! Staying at the Disneyland Hotel, we were able to enter the parks an hour early every morning, for “Magic Hour”. This was a game changer! You beat major crowds, which means fewer lines and less chaos for the kids to adapt to first thing in the morning. We picked the 2 or 3 rides we really wanted to go to, that normally have a 90 minute wait the rest of the day, and zipped through. For Disneyland Magic hour we hit Small World and the Buzz Lightyear ride. For California Adventure Magic Hour we did the Cars (my favorite!) and Monsters Inc. If you aren’t at the hotel/don’t have Magic Hour, look into the FASTPASS. Costs some money, but you can skip the line on popular rides at specific times of day. We didn’t have FASTPASS, and didn’t really miss it because we had Magic Hour. 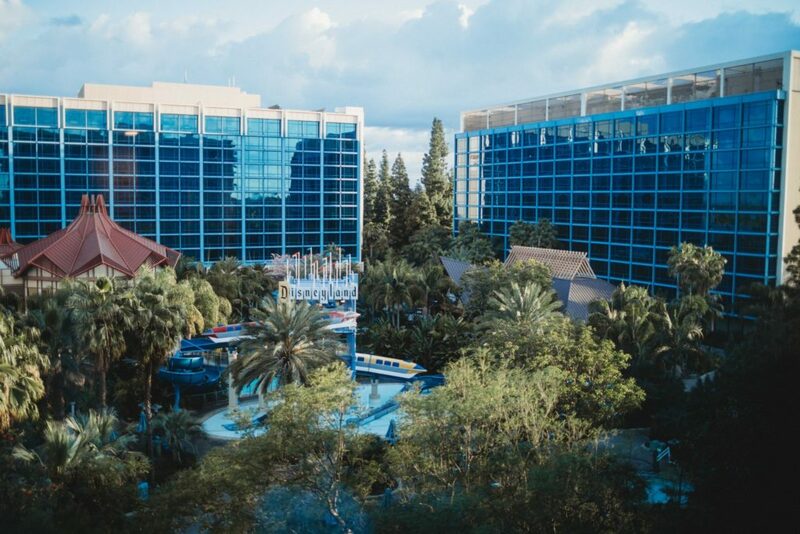 From the Disneyland Hotel you will walk through Downtown Disney (outdoor shopping mall) to get to the parks. There’s a security check to get into Downtown Disney, so be at that entrance at least a half hour before Magic Hour starts. The security line can get longer with the hotel guests. Some security guards were fast, others were very thorough and painfully slow. Keep an eye on which line is moving fastest and get in that one! Once you’re through security, it’s about a .5 mile walk to the parks entrance. Expensive and just so so. Knowing that ahead of time was helpful! There is no grocery store so you’re eating out for every meal. The restaurants are all very kid-friendly, though, and almost all are casual wear. Come as you are! Goofy Breakfast! Handed my SLR to the PhotoPass photographer! Breakfast: we hit Starbucks every day (in Downtown Disney) for coffee, muffins, oatmeal. It was just fine, especially since our kiddos were up at 5am! Lunch: La Brea Express was nice for grab-and-go sandwiches, fruit, etc. We stopped here for lunch on the way back to the hotel, and ate in our room while the kids had some quiet time and naps. Trader Sam’s inside the Disneyland Hotel had some decent take-out, and lunch options too. Dinner: Make reservations on the app ahead of time! Some get booked up months in advance. Everything is sit-down and crowded. They charge $10/person if you cancel same-day, FYI. Our favorites were La Brea (sit down) and Tortilla Jos. Food was decent, and they were close to the hotel. ESPN was just okay, and Rainforest Cafe had fun ambiance for the kids. We did a character breakfast on the third morning and it was a HIT. My daughter went nuts for Goofy, Chip and Dale, and Minnie. The food is buffet-style, all you can eat, and anything you want! We might have grabbed some extra muffins and fruit for the day as we left the restaurant (wink wink). Call me a spoiled Pacific Northwesterner, but the tap water at the hotel was awful. Really bad. The only option was to buy $3 bottles of water in the store or hotel vending machines. We just brought our own bottles into the park, and filled them up at the drinking fountains. Buy Snacks at home and pack them! On a friend’s advice, I purchased individual Goldfish, animal crackers, raisins, and a bag of DumDums at QFC in Seattle and packed them in our bags. I was so glad I did! Once we got to Disneyland there was no store, mini mart or anything. The only easy snacks to grab were $8 each, and full of sugar. Having our own snacks, that we knew the kids liked, was a win. Especially when we walked long distances, or had to wait in an extra long line. We walked and walked! About 16k steps a day/7 miles. Comfy shoes and lots of water were musts. We took our Bob stroller, Ergo, and a second umbrella stroller. SO glad we brought the Bob as we ended up dumping a lot of items in it, and my son was able to rest more comfortably. There are strollers to rent but they didn’t look that comfortable, and the renting and returning would’ve been time and a hassle. My 2 year old especially was scared often by the noise and crowds. She just wanted to be held. She refused the Ergo and stroller often. I carried her a lot. I could’ve been frustrated, but I enjoyed the snuggles and kissed her often. These years don’t keep. Bonus workout included! Dum Dums were a fantastic bribe when they were tired of walking/riding in the stroller.Also the ColorBook app was a hit! Downloaded it on a whim before we left, and they loved it. It’s basically a digital coloring book. All the snacks we brought with us were put to good use. The Disneyland App is amazing. My MIL and I would use it to plan a few rides, 1 attraction, and find a couple characters for them to meet in the morning. We could make reservations, and access PhotoPass photos too. You’ll need to setup an account to get started. Cars, Toy Story Mania, Monsters Inc. were by far the favorites for our kids, but lines could get up to 90 minutes. 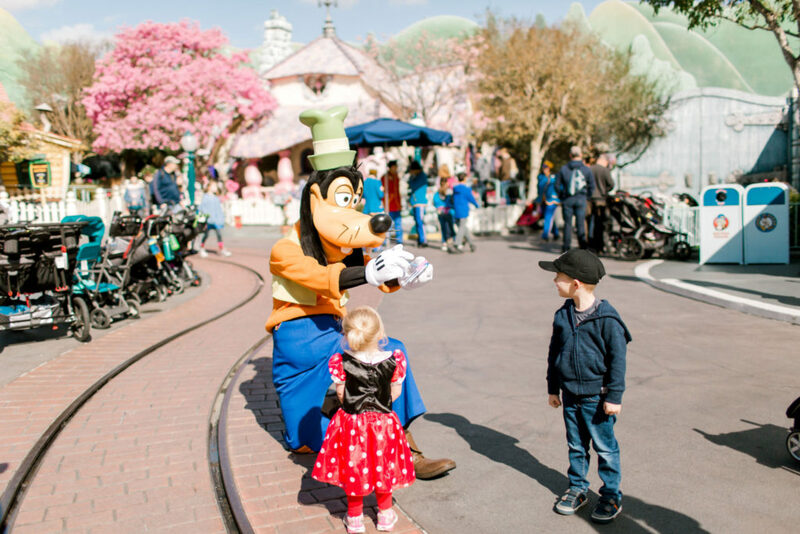 Use Magic Hour (or FASTPASS) to hit these first and avoid the waits. We could do 2 or 3 rides, and see one or two attractions before the kids were toast and ready for lunch and nap. We came back to the parks in the afternoon and the kids gave us about 2 hours before they were tired again, ready for dinner and bed. We wanted to hit ToonTown in the morning but when we got there, it didn’t open until 10am. Another time we wanted to do a ride but the kids were just toast, so we fell on a Jedi performance in the main square. Things didn’t go to plan, but we had fun regardless. All the grown ups stayed flexible! Take advantage of no lines! The Ariel ride, Teacups, and some of the characters had hardly any line. Jump on the opportunity! You could be in and done within 10 minutes. This ride was one of our top 3 favs, but wasn’t open for Magic Hour. Instead we lined up with a small crowd at the wharf, right before it opened at 9:30. The staff took down a rope and we hustled right to the ride. Wait was 20 minutes, instead of 2 hours! Shot ISO 100 often, with the bright sun. Loved the pastel colors all over the park! I wasn’t sure if I wanted to lug my SLR, but I ended up bringing it and am so glad I did. I brought one body (Canon Mark iii), one lens (35mm 1.4L), an extra battery and memory card. My small Crumpler camera bag (“5 Million Dollar Home” link here) doubled as my purse and was easy to take on rides (I wasn’t sure about this, but it was fine!). The sunrise light was gorgeous and the crowds were few! Great time to take family photos at the popular backgrounds like the castle and main entrance. I photographed my MIL wiping my daughter’s nose with kleenex, a couple grumpy faces, and my son looking tired in the stroller. 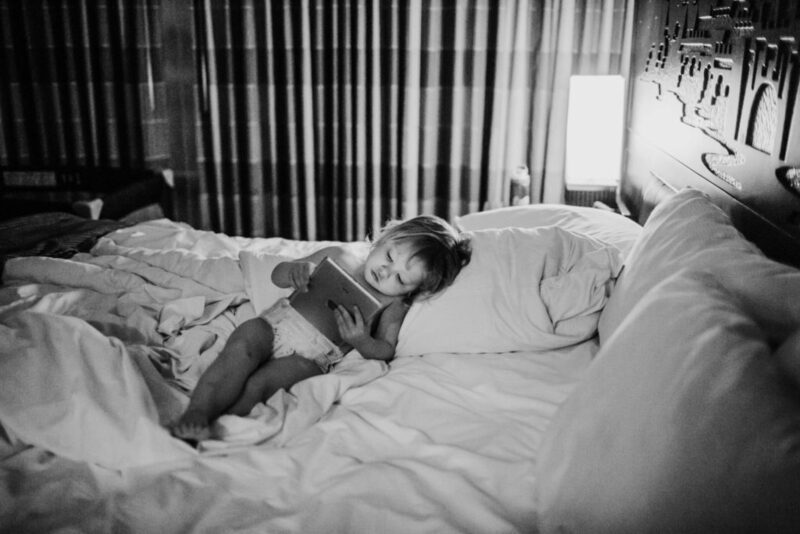 We’re already looking at the photos and laughing, because that was our experience. It’s worth photographing! There’s a viewpoint of the rollercoaster at California Adventure that was empty, but a great photo opp. Same with the topiaries in the garden at the Disneyland Hotel. Just because they’re not popular, doesn’t meant they’re not gorgeous! There are photographers all over the park that will take your photo, and you can buy the images later through PhotoPass. They’re $12 each, or $180 for all. It’s a nice service, and they take great photos. However, you can hand them your own camera and they’ll take a great photo! 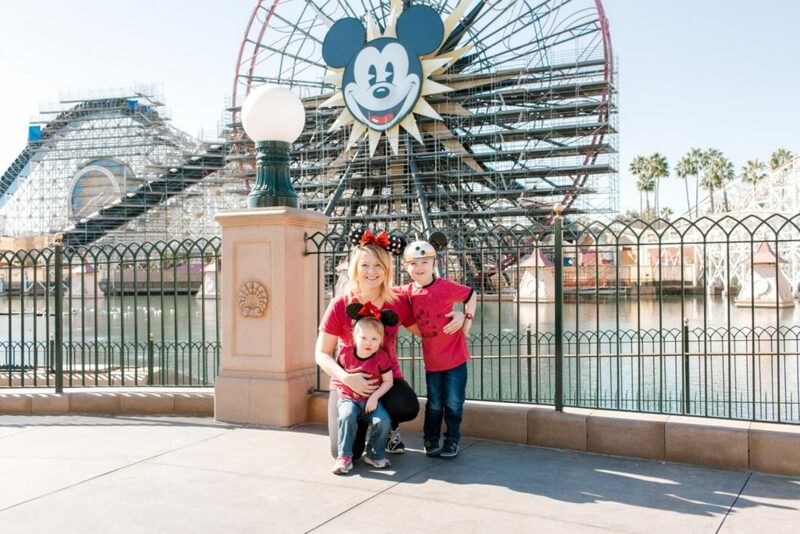 Save the PhotoPass money, and have instant access to great photos on your own memory card. 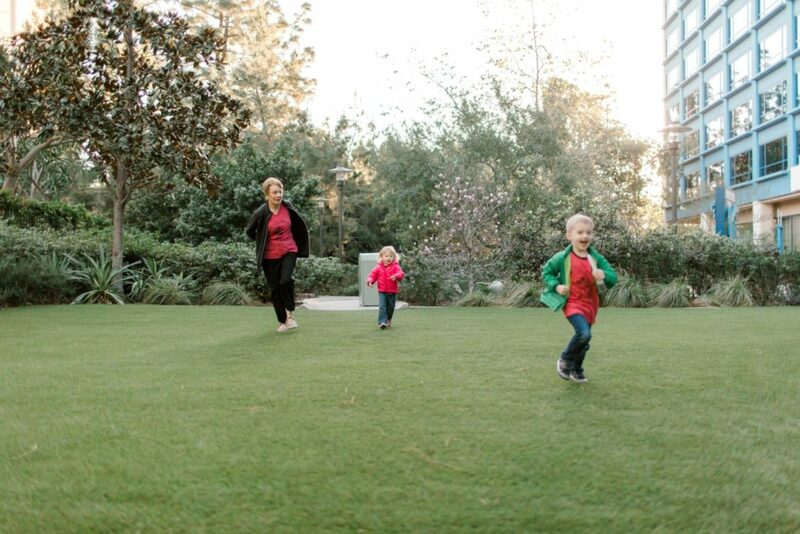 Moms – get in the photos! 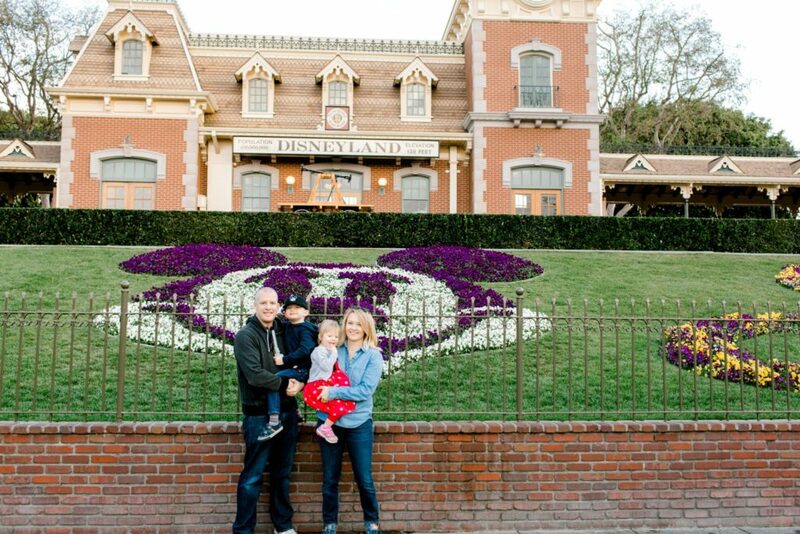 Make sure to hand your camera to your husband, in-laws, a stranger, or heck Mickey Mouse and get in the darn photo! You were there too Mom! Amazon Photos for Galleries and Sharing! I use Amazon Photos for my cloud backup and love it. For this trip, for example, I used the iPhone app to upload my mobile photos and video. Then on my desktop I can upload my SLR, nice images to the same folder. I shared the link with my mother in law, who can add her photos to the same folder. Everything in one place! The photos stream to our Amazon TV, so we’re able to watch a slideshow of the images in our living room. Such a fun way to enjoy the photos! I plan on making an album too. 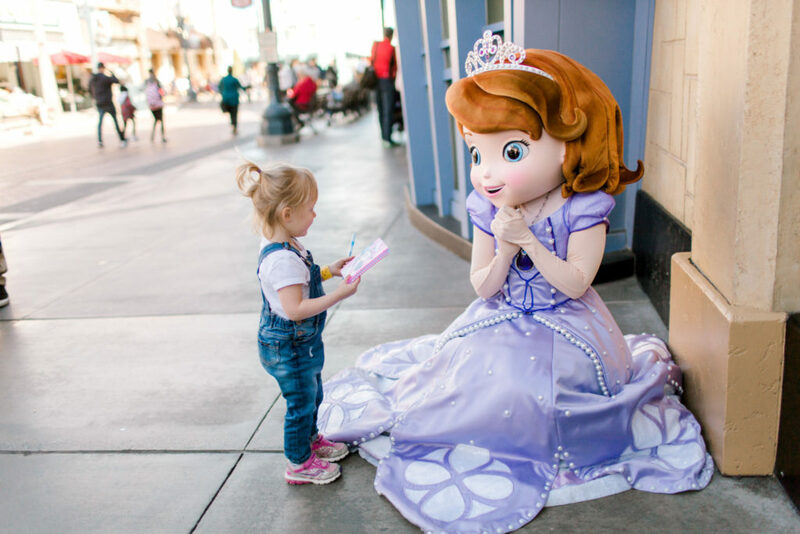 photo is even cuter with the costume! Cold and dry in February! We went in February, with highs in the low 60s and lows in the upper 40s. Midday was t-shirt and jeans weather, but morning and evenings were COLD! Luckily I had a down jacket and fleece for everyone. We wore them! The other thing that surprised me was the dry air. By the time we left my daughter’s cheeks were cracked, my MIL’s hands were red and raw. Bring lotion and maybe cortisone or Neosporin too. I went in the pool with my 5 year old on the warmest day , but it was a quick, cold dip! Had we traveled in a warmer month, we definitely would’ve been in shorts, and used the pool for a midday break. I’m keen on packing for style but Disneyland is a marathon! I wanted to wear my classic Jack Purcell’s but my feet would’ve been screaming. I wore jeans, t-shirts, and New Balance/Nike kicks. Comfort beat out style, and we appreciated having lots of layers. Also leave room in your bag (or bring an extra) for all the goodies you’re sure to accumulate. Here’s my downloadable and printable packing list. I’m OCD! One of my favorite pics of the whole trip. 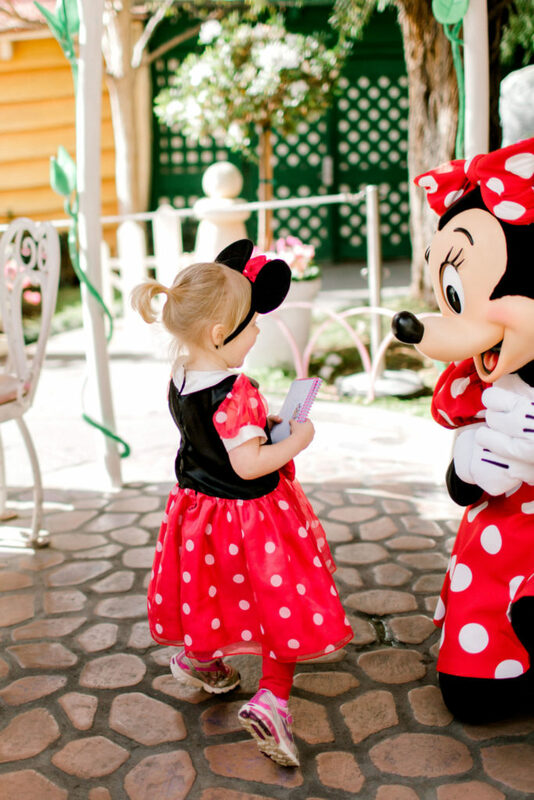 My little Minnie meeting Minnie! My daughter brought her Minnie costume and it was so fun to photograph her in it, especially when meeting Minnie. That photo is my favorite! I was surprised more kids weren’t in costume. After we saw the Jedi show one afternoon, we went back to the hotel and my son played in his Darth Vader costume and re-enacted the show. I say bring the costumes! If you don’t have any, post to your local Moms Facebook or Buy Nothing Group. I’ve collected most of our dress up bin this way! Sustainable and saves some moola. Matching shirts and ears. Great photo spot on the wharf in California Adventure, with no one around! Buy Disney hats and apparel online before you go. Old Navy, Gap, and Target have great, affordable options. Once you’re in the park, everything is $30 or more. Better yet, borrow apparel from friends! Almost everyone that’s been to Disneyland has tees and mouse ears. Just borrow from a friend , save some money and the planet 😉 Also, order autograph books on Amazon beforehand. I found these for just $7. There are stores and stands everywhere, and the kids can get a bad case of the gimmies fast! After one big tantrum from our 5 year old, we made a plan: Day 1 was just looking at toys, Day 2 he could get a toy at the end of the day for doing a good job (no tantrums), and Day 3 was the same thing. Setting his expectations helped a lot and nixed the meltdowns. There are photographers all over the park that will take your photo, which you can buy later. They’re $12 each or $180 for all. 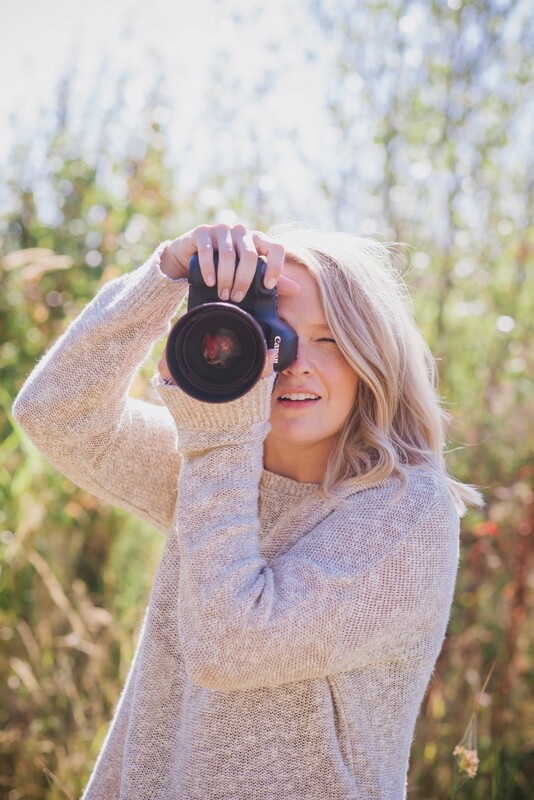 What I quickly discovered is the photographers are happy to use your camera! They take great pics, you save money, you’re in the photo, and have instant access to the images. There is no grocery store or sundry place anywhere. We needed tylenol, sunscreen, neosporin, etc. and I’m so glad I didn’t pay the crazy markup in the gift shop. If you think you’ll need it, pack it, or face the dreaded 300% markup! 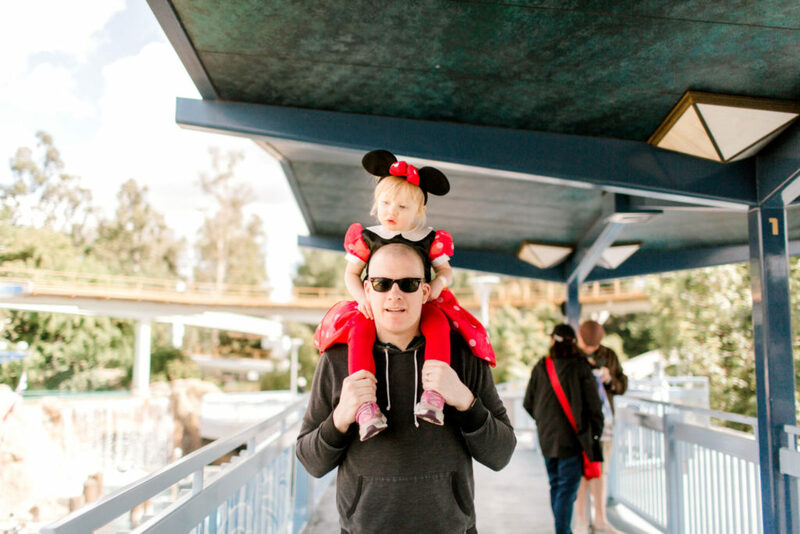 Disneyland is fun of course, but so overwhelming for littles too. 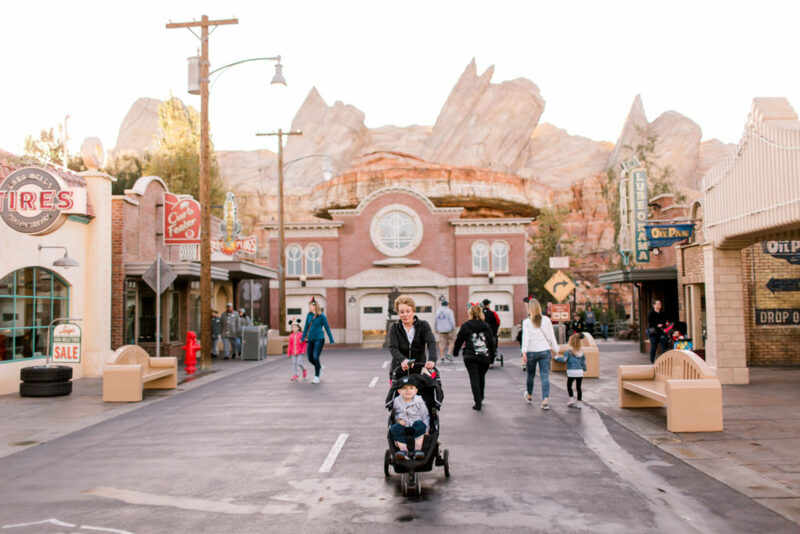 We grown-ups know amusement parks and how it all works, but a 2 year old is bombarded with lots of stimulation, walking, and being constrained in lines and on rides. There were very few options for them to run and wiggle, or play with something tactile. My son kept asking to go back to the hotel so he could just play with toys! Every hour or so, I would get down on the kids’ level and tell them what was going on, and the next three things we’d do. I’d check in and ask how they were doing – were they cold, hot, hungry, tired, need a hug? The check ins helped a lot. With older kids, we might have been able to do all the rides and attractions. With littles, it would’ve been overkill. We had a few things we wanted to do each day, got them done in the morning, and the rest was just bonus. We did NOT get to everything, and it’s okay. Had we tried to go go go all day long, it would’ve been a disaster. Our attitude was “it’s all fun, and we’ll be back”. We were in the park at 8am and by 11am the kids were exhausted. We went back to the hotel for 2, sometimes 3 hours. The kids would play quietly with their toys, nap, or go for a dip in the pool. We went back to the park in the afternoon, at half the speed of the morning. Disneyland, to my surprise, was mostly rides and very few opportunities for the kids to move and play with something tactile. Get their wiggles out on the lawn outside the hotel, in Downtown Disney by the main stage at night (there was always a band), play in ToonTown or at the LEGO store. We also enjoyed the Disney Junior Dance Party! since they could shake off some energy! Take a break midday at the hotel for peace and quiet, or a swim. The kids definitely needed breaks for quiet, play, and movement. Her smiles meeting the characters were my FAVORITE part of the trip. She was so happy! Phew! Okay that’s just one perspective from one mama. The trip was pretty exhausting but well worth it. Watching the smiles, giggles, and glee on our children’s faces was the best part by far. We made 100 memories we’ll never forget! Hopefully some of these tips help you have an easier, more relaxing time in the happiest place on Earth. Right before we headed home. Pretty spot near the topiaries at the Disneyland Hotel. Asked a nice Dad to take our pic! Not perfect but WE’RE ALL IN IT!